So, my family, as many of you may recall, is Norwegian. My Dad's Mother's side. We have incorporated a lot of Norwegian traditions, especially around Christmas time. Jule Kakke, which I mentioned in a blog post two years ago, Ghejost, which is a carmalized goat cheese and spelled 8 different ways depending on where you look and who you ask, the Dala horses we have up and about everywhere in our house, and many other little Norwegian things we've kept up from generation to generation. 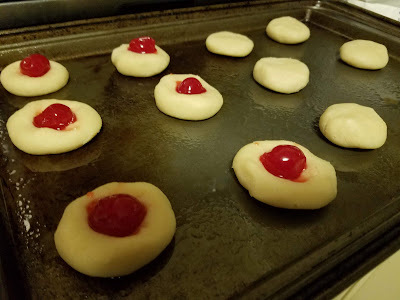 One thing that I kind of picked up and kind of remember someone doing at some point in my childhood was the almond cookie with the maraschino cherry in the middle. It wasn't kept up year after year, however, which makes me think that maybe my grandmother was the one that made them once or twice, and then she passed away when I was pretty young. Regardless, I kind of put together my own cookie recipe. YES you read that right, I can bake something. Add flour and extracts. I use 1/2 teaspoon of each extract, as Breaky finds the almond overpowering if I do a whole teaspoon, which many of these recipes call for. Up to you though.